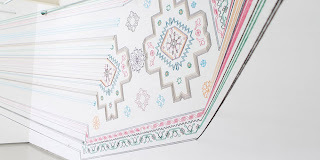 Faig Ahmed's installation "Embroidered Space" is so wonderfully inspiring that I had to share it here. 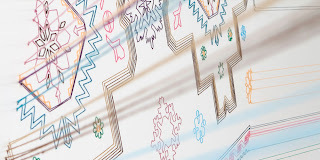 According to his website, Ahmed gathers a lot of his inspiration from the Azerbaijani traditional rugs. "he disassembles their conventional structure and randomly rearranges the resulting components of the traditional composition then combines these fragments with contemporary sculptural forms." The piece I'm showing images of uses carpet thread to create a beautiful work of art. The use of such a soft medium on a hard surface means that this installation falls into my "obsessed with juxtaposition" category, but that's not the only reason I'm in love. The colors selected are beautiful, light and airy but still vivid enough to be eye catching on the white wall. The threads leading to and from the piece draw your attention, and the details keep it there.